DecoArt developed Americana Decor® Texture™ to allow makers to embellish furniture and home décor pieces with added dimension. The heavy-bodied paint makes building texture easy, and it possesses excellent adhesive properties. 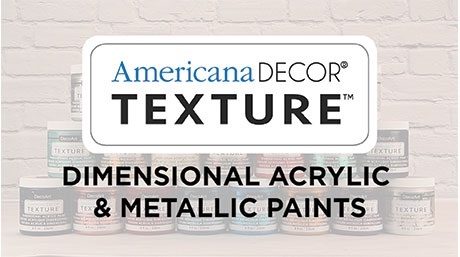 Americana Décor Texture is easy to use with a stencil and can be applied with a palette knife, texture tool, or brush. 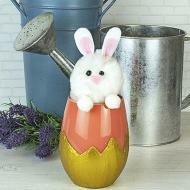 For even more customization, embellish with glitter or other additives. Heavy-bodied acrylic that allows makers to add dimension to their furniture and home décor pieces. Its easy-to-use formula possesses excellent adhesive properties and creates smooth texture. This is the ideal paint to use with stencils and texture tools for added effects. 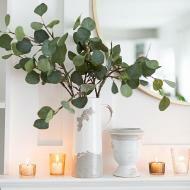 Flexible home décor stencils made for durability and ease of use with either paints or texture products. With laser-cut designs appropriate for indoor and outdoor projects and a variety of sizes, Americana Decor stencils work for almost any home decorating style. Lettered and repeating pattern stencils include alignment guides to help with accuracy.